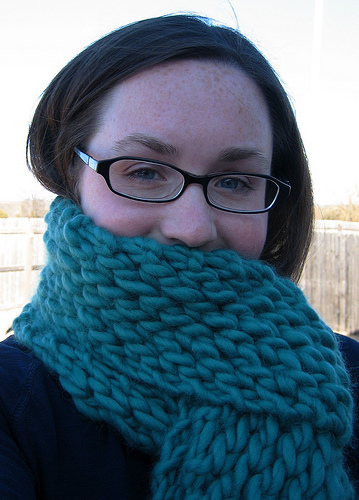 I’m a knitter, grad student, dog lover, friend and family member – all in Oklahoma. The activities associated with these roles keep me pretty busy . . .
Hi! I’m glad you like the pattern! If you wanted to make this in a larger size, it would be necessary to cast on a larger number of stitches (based on your gauge and how large you want the neck opening to be), then you could work more raglan increases in order to make the yoke deeper and the body and sleeves bigger. Since it is a top down design you could try the sweater on as you go to make sure that the chest and sleeves are big enough. Good luck! Hi! Which pattern are you referring to? Do you know the gauge listed on the ball band for your cotton yarn? Congratulations on getting published!! I love the Margot sweater, especially the vents on the sleeves and hem. I immediately requested one as a Christmas gift from Emily! Congratulations on the Knitty sweater! Hi! I realize that you’re probably long past this, but I’ve begun knitting “Baby Sophisticate” as a Christmas gift for my niece. I have a question about the section right before “Split for the body”, and I was hoping you could help. I’ve always been confused as to what “ending with a WS row” means. I know it means ending with a wrong side row, but does it mean that you finished that section by knitting a wrong side row, or that you’ve ended that section and your next row will be a wrong side row? I’m guessing the former…but wanted to check. Because if that’s the case, then if I knit row 13, and then knit row 2 four time, alternating with row 13 four times, I finish with a right side row. I hope I’m making sense. :0) If you could help, that would be great! Just wanted to let you that your blog is wonderful! I’m always thrilled to come across blogs that are both well-written and entertaining. I’ve just started knitting (in my not-so-early 30s), and even though I’m still working on my first scarf, I seem to be addicted to seeking out new projects to try. I’m hoping to try a pair of socks and/or something with a simple cable pattern soon–I’m determined to master the cable. Are there any beginner/easy patterns you recommend? I’m looking forward to following your blog – keep on knitting (and writing)! Thank you so much for letting me know that you like the blog – comments like yours keep me writing and take away the feeling that no one is out there! I also always love to hear about new knitters who are really excited to learn new things! Have you checked out Ravelry yet? It’s a great resource. As far as beginner sock patterns go, I’ve heard great things about the Yarn Harlot’s “Sock Recipe” from Knitting Rules. For cables, I’d grab a copy of Vogue Knitting and try out a few swatches – I’m sure you will get the hang of it really quick! I just love the pattern Baby Sophisticate. I bought Blue Sky Alpace’s 100% organic cotton for the project. Is the pattern available for a child size? I would really like to make another one in a larger size. I do not have the expertise to change the pattern. Thank you for sharing your beautiful pattern. I’m loving your blog and all the patterns, such an amazing work… I’ve 2 little nephews, do you sell what you make? I’d love to learn how to knit but whenever I try I feel I’m just not patient enough… I’ve lots of ideas and I draw them but I can’t put them in practice. I’m always amazed by people, like you, who can turn great ideas into real objects :) Congrats! Please let me know if you sell your work. Greetings. Just downloaded “Deidre”, which I intend to knit, thank you very much. I am not fond of the YOs down the center (they’re in almost every shawl pattern). I heard once that purling through the back loop will close those holes. Or should I do as directed in the Edging, and make M1R and M1L instead? Hi! Yes, you’ve got a couple of options if you don’t want to do YOs down the middle. You can purl into the back loop on the return row, which will tighten up the YOs and make them less obvious. You can also do a M1R and M1L at the center, which will have a similar effect, but will be a little bit more balanced because the increases will be pointing in the correct directions (it’s a subtle difference, though). Either way should work, so it’s up to you! Just discovered your site – love it! I was thrilled when I read your post about the two LYS, Mosaic Yarn and Loopy Yarns, you visited while in the Chicago area. I have happily shopped both stores and LOVE them! So glad you enjoyed your visit. Keep up your awesome site – HAPPY KNITTING! I love this pattern and so far it has gone pretty well. I would like to know how many stitches are picked up for the collar and what needles are used. I think the directions should be more clear at his point. I’m not sure how many I picked up but I did use the circular needles. Please let me know as soon as possible, as I would like to finish the sweater. Thanks. Hi! Using the circular needles is fine for the collar. The reason I don’t give a number of stitches for the collar is that it will depend on each person’s row gauge and how long they made the body of the sweater. You should be good if you pick up 1 stitch for every two rows (that is every slipped stitch on the edge if you slipped a stitch at the beginning of each row) and then one stitch per cast on stitch around the back of the neck. Good luck! I am writing from Germany and I started to knit with American patterns to learn and understand them. Found your free pattern for the Baby sophisticate published in April 2009, so far a great step for me until I came to the collar area. Here I am total out of any knowledge. how to make the buttonwholes which is not in your pattern discription. the collar itself is not what I understand completely where to start excactly. Is there any chance that you could help me with it.? I would love to show my family in KS that I am able to knit with the Americans!!! Best regards from Laufenburg/Germany- Black Forest. I made a baby sophisticate and it turned great. I’m now knitting sophisticate for Woman size M, and I’m confused with the instruction on begining the cardigan. My question is how many rows 3 do I have to knitt, in which I increase the front of cardigan. Otherwise how many stiches do I have to have for front ( each) of the cardigan? Sorry for my english. Hi Vesna! I’m glad you enjoyed Baby Sophisticate enough to try the adult version! You should be knitting row 3 a total of 8 times — but remember that you are alternating row 3 and row 5 — you need to work rows 2 through 5 a total of 8 times — so it will be 32 rows total. After completing this series, you should have 28 stitches for each front, 42 stitches for each sleeve and 56 stitches for the back. Hope this helps! Happy knitting! Hello. I’m trying to knit up your pattern “warm and cozy socks” but I’m having trouble with the turn heel. It keeps coming from a side instead of entered in the bottom. Can you please help me figure out what I’m doing wrong? I love the Stella sweater. I’m toying with the notion of making the yoke in one color and the sweater in another. Any ideas?